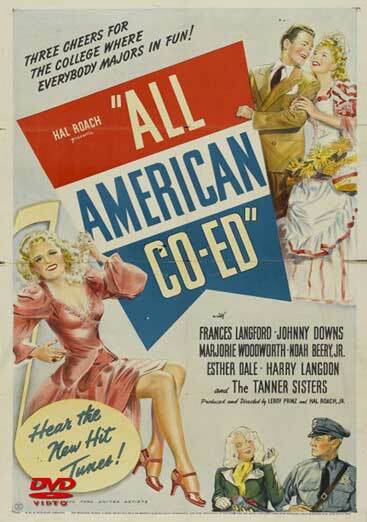 All American Co-ed is an Oscar nominated musical comedy centering on the rivalry of two colleges, all-male Quinceton University and all-female Marr Brynn University. After some Marr Brynn students get publicity by insulting Quinceton University, some fraternity brothers plan to get revenge. They have one of their frat brothers enroll at the all-girl school, disguised as a woman with hopes of having him enter their annual beauty pageant. Starring: Frances Langford, Johnny Downs, Noah Berry.Jr. – 1944 – BW – 51 Minutes. DVD, Digitally remastered.